The 1753 Bachmann Publick House contains the last remaining Northampton County colonial era courtroom that has been restored to its colonial era appearance. 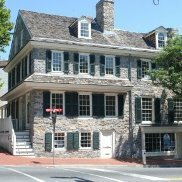 Located at the northeast corner of Second and Northampton Streets, the Bachmann is Easton’s oldest building. It was owned by George Taylor and served as his principal residence. The BPH is open for programs and special events. Tea parties, colonial activities and dinner theatre offered by the Bachmann Players are some of the activities that are frequently held. The BPH is also available for group tours and private rental.